IFA 2011: Yamaha launching new all-in-one systems, including soundbars | What Hi-Fi? 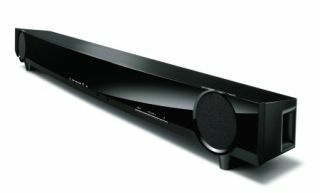 Yamaha has used IFA to launch a raft of new products, perhaps most enticing of which is a pair of affordable soundbars. The YAS-101 will launch in November for just £220 in black, or £250 in silver. It uses speakers at either end to send sound around the room, while a downward-firing bass driver apparently negates the need for a separate subwoofer. One step up is the YHT-S401, which replaces the excellent YHT-S400. This £499 model will be available in October and uses Air Surround Xtreme to simulate 7.1 surround sound from a passive, height-adjustable bar and separate amp/subwoofer unit. This main unit can be mounted horizontally or vertically, has three HDMI inputs and one output, 3D and Audio Return channel compatibility, and a digital iPod/iPhone connection. Also costing £499 and available in November is the BDX-610 5.1 home cinema system. This consists of a BRX-610 main unit, which acts as Blu-ray player and amplifier, and a set of stylish 5.1 speakers. As you'd expect, the HDMI output is ARC compatible, and there's a USB socket that can extract digital music from your Apple iDevice. Those looking for an ultra-stylish all-music system may well want to take a look at the Restio ISX-800 when it hits shops in October, also priced at £499. The square unit is avilable in a variety of colours and can be mounted on a wall or dedicated stand. On the top edge you'll find a slot-loading CD drawer, USB connection and dedicated digital iPod dock, and behind the grille is a two-way, four-speaker system.